See below for a guest blog from John Donnelly in which he describes the success of PROSALUD, a nonprofit healthcare group in Bolivia. This post is part of book from MFAN partner Management Sciences for Health (MSH). This is the fourth post in our field feedback series; click here to read a post from Save the Children in Guatemala, Women Thrive in Ghana, and Oxfam America in Uganda. The United States Agency for International Development’s (USAID) emphasis on building local capacity is a welcomed pillar of USAID Forward reforms because empowering local communities to become strong and capable development stakeholders helps ensure the long-term sustainability of poverty-reducing programs. Below is one example of how USAID worked through Management Sciences for Health (MSH) to build, nurture, and support a local development stakeholder that is still thriving today. The story was written by global health writer John Donnelly, and first appeared in MSH’s book Go to the People in 2011. Together with its partners, MSH helps institutions and organizations develop effective leaders, create robust management systems, strengthen pharmaceutical systems, and expand human resources for health to strengthen health systems for greater health impact. MSH looks forward to continuing to work with USAID as it expands its efforts to strengthen local civil society organizations in the developing world. Read more stories from MSH on the Global Health Impact blog. Newly freed were two organizations: MSH and PROSALUD, a nonprofit Bolivian healthcare group. The two had worked intensely together with USAID funding designed to support the local group in building up health systems in Bolivia. For MSH, that ceremony in 1990 fulfilled one of its fundamental goals: When its work is over, it leaves behind a locally run center of excellence in health care. For PROSALUD, the ceremony signaled the beginning of being on its own. Now, more than a quarter-century since the start of the relationship, both organizations look back and see they forged an approach to development that allowed a local organization to prosper. Ron O’Connor, MSH’s founder, says the relationship worked because both sides had the same goal. PROSALUD soon started securing its own funding from the U.S. government. Even as it Expanded services in Bolivia, it also was advising other nonprofits in other countries on how to operate more efficiently and build stronger health systems. Today, PROSALUD has created a primary and secondary health care model that works in six of Bolivia’s nine departments, operating 27 clinics, five hospitals, and one child development center. All of its clinics have pharmacies, delivery rooms, waiting rooms, and reception rooms. The clinics and ambulance services operate every hour of the year. And while it is primarily known for providing quality services at a low cost, its reach and accessibility has combined to produce extraordinary numbers in health service delivery: more than 6.7 million medical consultations, more than 2.2 million immunizations, and more than 75,000 births. When Cuellar looks back at the start of the relationship with MSH, he sees many factors were in alignment. 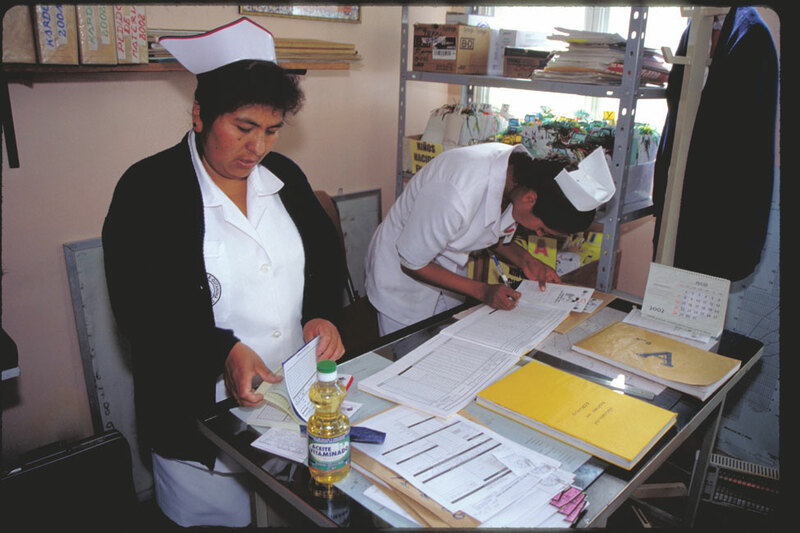 Photo caption: Bolivian nurses (photo credit: MSH).